My experience working with hospitals and practices has allowed me to understand what physician recruiters in these facilities need from the candidates they’re considering in order to make the best hiring decisions. Here’s what you need to provide recruiters to help the process along. It is crucial to include your contact information when you contact a recruiter about a position. Include an easily reachable phone number like a cell phone number. For the recruitment process to work smoothly, both physicians and recruiters should make themselves available to each other. Each must be willing to return phone calls promptly. Provide a professional email address that you check often. Avoid making your email address something too personal hotdoctor@email.com. Reserve that for family and friends, not potential employers. In addition, personal information (think marital status, interests and hobbies, citizenship and visa status, and whether you have children) is something you may also want to share with the recruiter and employer to help them understand your personal situation. Next, make sure to discuss your geographic considerations. These can include not only where you want to practice but also factors such as community size, climate, proximity to family and friends, proximity to an airport, daily commute preferences, and schools and activities needed for your children. One thing to remember: When looking for opportunities in particular areas, research the supply and demand in that market. If the physician supply is great in the area, there could be less demand, which could have a negative effect on compensation. Lifestyle considerations are also important when talking to a recruiter. Discuss the area’s cost of living, opportunities for your spouse, recreational activities, religious opportunities—even access to entertainment, dining and shopping if these are important to you. Ask about the types of benefits the practice offers. Another lifestyle consideration is your schedule. Do you want to work full-time or part-time? Make this clear and also ask about call requirements and the hours you’d be working. The practice setting that interests you is also important to share. This may mean being employed—or becoming a partner—in a single- or multispecialty group, working in solo practice, being employed at an academic/teaching hospital, working as a locum tenens physician or being a hospital employee. Make your preferences clear. Other important considerations about the practice setting include staff and technology. What types of relationships will you have with the other physicians in the group? Is this the type of practice you can see taking care of your family? Are there nurse practitioners or physician assistants in the practice? How would you be expected to work with them? Does the practice have an EHR? Which system is it, and how does it interface with the billing system? If you have preferences about any of these issues, make them clear to the recruiter. Make sure the recruiter or employer understands how you see your career path. Do you want to settle in one location for most of your career? Will you want to do administrative or executive work? Do you want to teach or research? Remember, career advancement can come in the form of greater responsibilities or could require more experience and education. Once you start in your new practice, you will continue to develop your skills and practice style, and your personal priorities may shift. Remember this when you look for a position. Try to determine if it will be a good fit for more than three years. To make sure a potential employer knows what is most important to you in your job search, please reach out to PracticeLink’s Physician Relations team at (800) 776-8383 or PhysicianRelations@PracticeLink.com. Our team can work with you to create a free profile that includes all of the information recruiters and employers need, helping you in turn find your first or next job. Tammy Hager is director of PracticeLink’s physician and client relations teams. Shannon Clark, M.D., found her new job in Virginia Beach through PracticeLink! Clark enjoys watching movies and spending time with her husband and daughter. What surprised you about your first post-residency job search? Neurosurgery has very few graduating each year, so I thought I could take a pick of jobs in even a very desirable location. But the reality is most of the openings, even in neurosurgery, are in out-of-the-way, smaller locations. Because of this, looking early and carefully for what you like is very important. I’m very happy I found a job in a wonderful location—Virginia Beach. What’s your advice for residents who are beginning their job search? Start early, and gather advice from the residents who graduated before you with multiple interview experiences. They gave me tons of info including the good hospital systems to interview with, the whole process, and even the exact number of their salaries and sign-on bonuses. What was the most important factor in your search for a new job? Location. For neurosurgery, building a practice is possible in most locations, even in competitive areas, with about five years of investment. Finding a place that you and your family can be happy with is the most important thing. How did you find your job? I applied via PracticeLink. I started out very early (May of 2016 for a starting date around August 2017). I also tried to put in an enthusiastic message about the job rather than just sending my CV. How did PracticeLink help you in your job search? It’s one of the posts I saw on PracticeLink that I applied to. The job description is exactly what I wanted. I’m very happy I looked through PracticeLink diligently! 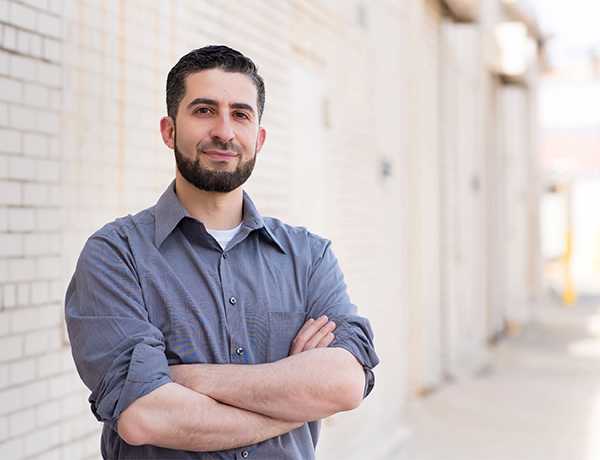 Wael Hakmeh, D.O., FACEP, has served on multiple mission trips with the Syrian American Medical Society (SAMS), a nonpolitical organization that does medical relief work in Syria and around the world. He has arranged his schedule as a locum tenens physician in a way that enables him to make trips several times a year. Prior to arriving in Syria, he taught an emergency medicine/critical care course to Syrian health care workers in Turkey, preparing them to treat the traumatic injuries commonly seen there. Hakmeh was honored for his volunteer work with the 2016 MedicalMissions.org Physician of the Year Award. What do you like best about being a medical missions physician? Medical mission work gives me a chance to practice medicine for the reasons that many of us went into medicine: to help those who need it the most. In Syria, over 95 percent of the physicians who were once there have been imprisoned, fled the country or were killed. A lot of health care providers get killed from indiscriminate government bombings. The Syrian patients I met are some of the warmest and kindest people I’ve ever met, so to be able to practice medicine there is the most rewarding thing I’ve ever done professionally. Did you specifically request to go to Syria? Yes, a couple of my colleagues shared with me their experiences from working there—I’m very grateful to them. Several times I planned on going into Syria, but for different reasons, of the five times I planned to go, I was only able to twice. While I’m confident working there helped patients, I always left there feeling I benefit the most personally. The strength and perseverance of the people there is uplifting and difficult to put into words without doing injustice. The presence of volunteers lets them know they are not there alone and that the world has not forgotten them even though in reality, it has. So I think what I and the other physicians provided was as much of a psychological boost as any life-saving procedure we could perform. Medical mission work gives Wael Hakmeh, D.O., a chance to help those who need it most. How long do you spend there? It was a short time, usually about a week. You have to factor in that you can get stuck at the border, and there’s a lot of uncertainty with the bombing. The roads can be closed. At the time I was last there, there was only one road in and out of Aleppo, dubbed ‘the road of death,’ and now that road is cut off [before the siege against the entire city ended]. There’s a lot that has to be taken into account. If I could have stayed longer, I would have. We spent the greater part of a week training Syrian physicians and medics in emergency medicine and ICU training courses in Turkey prior to my work in Syria. My whole trip is usually 2 1/2 weeks. How many trips have you made? I’ve been to southern Turkey seven times, where we had the training courses. I was able to go into Syria twice. For a number of different reasons, I wasn’t able to go into Syria. One time, the border was closed and they would not let any health care professionals cross. … Another time, I tore my ACL a few days before playing basketball. What don’t you like about medical missions? There wasn’t much that I didn’t like about it. The biggest thing that bothered me was the amount of preventable deaths and injuries that didn’t have to happen. For example, my first day there, a barrel bomb was dropped on an open market as people were shopping with their kids. Fifty people were killed that day for no reason. These aren’t people on battlefields, just people shopping for fruits and vegetables trying to figure out what to cook for dinner. This part of it was frustrating. The lack of news coverage about the deaths and injuries was, too. One night, 40 people were killed and the bodies were lined up … a lot of horrific scenes. I went online that night to different news outlets, and there was no mention of the incident. That’s why the people feel that the world has turned their backs on them. Medical missions expose its participants to uncomfortable truths of grave injustices. What surprised you most? The limitation of resources. The destruction is beyond anything that Hollywood could produce—the oldest civilized city in the world with a population of 3 million, reduced to rubble. It’s an unbelievable level of deprivation. It surprised me that the surgical room had a bug zapper in it, particularly in a country that had an excellent health care system 10 years ago. What appeared to be a soda machine was actually a blood bank. There are shortages of all medicines. Bringing narcotics across the border is not possible. I had to put a chest tube in a man with no analgesics at all. He begged me to let him die. Pain medication has to be rationed. This should never have to happen. Do you have any advice for physicians considering medical missions? The first thing to do is to find something you feel passionate about. Look for a credible and trustworthy organization to work with. Preferably, find something you can benefit from in whatever field you are in. Working as an emergency physician meant working in Aleppo made more sense than on the periphery where people by definition are stable. Talk to other physicians and learn from their experiences. Insight into which medical missions are good is generally [gathered] through word of mouth. If you decide to go somewhere where you could be in danger, you really need to give it a lot of thought. Pray and make sure you are 100 percent mentally and psychologically onboard. Is there anything else you’d like to add? As I just mentioned, pray about it. Make sure it’s what you want to do, particularly if it’s a dangerous venue. Once you are there, fear should not drive or dictate anything you do. Take a lot of stuffed animals as kids really love that. A lot of times, it’s not the medical work that we do; it’s your actions and genuine caring that people notice. It’s very meaningful and uplifting that somebody came thousands of miles across the ocean to care for them. That will do more good a lot of times than any application of medical knowledge will. Do your homework. Learn about the culture of those you will be serving as provision—culturally sensitive care maximizes your effectiveness as a physician. Physicians looking to relocate for a new practice have even more to do throughout their job search. This guide breaks it down. Janet Young, M.D., relocated twice in four years—once from California to Chicago, and once back. For Janet Young, M.D., an emergency medicine physician, it made sense to relocate. The large group practice where she worked had offered her an opportunity at its Chicago location that she knew would benefit her professionally in the long term. So in 2008, she packed her bags, and along with her two preschool-aged children and an au pair, moved from Oakland, California, to Chicago. Her husband remained in California a while longer. “I didn’t know anyone in the Midwest. I’d never even been there,” Young says. The move would not be a long-term engagement. Less than four years later, Young and her family relocated again, back to Oakland. Young is hardly alone in this relocation exercise. New physicians who train far from family and friends often return home once their training is complete. And more and more physicians are choosing to relocate even after a few years in practice. A 2016 report issued by health care data analysts SK&A found that nearly 14 percent of health care providers made some type of professional move within the past 12 months—keeping pace with what the U.S. Census Bureau says is the percentage of Americans who relocate each year. It’s possible that new physicians relocate in even higher numbers. In 2011, Today’s Hospitalist stated that as many as 70 percent of physicians change jobs within their first two years. Jeff Hinds, president of the physician consulting firm Premier Physician Agency, believes this trend may be because, “early in their careers, most young physicians do not know how to fully evaluate their job options, nor at that point, even know which practice settings or locations are most conducive to meeting their professional and personal goals.” But relocating closer to family, or even moving for more opportunity, like Young, can also explain the frequent exoduses. As anyone who has ever moved can tell you, however, relocating is not easy. That’s why it deserves careful consideration. Your experience, of course, will be unique, but their suggestions may provide you with a road map to make your relocation a bit easier. It’s possible you’ll have to return at least a portion (if not all) of any signing bonus if you leave before your contract term is up. “Responsibility for purchasing malpractice tail coverage could also be tied to completion of the full contract term,” Hinds adds. Any of these factors may play a part in your decision to leave—or at least in your timeline to relocate. “Seeking legal advice to help determine your ideal exit strategy is very important,” says Hinds. That’s the only way you will pick up on what Webber calls intangibles—the feel and culture of a place and the people who live and work there. “A place should make you feel welcomed and wanted,” says Webber, and that’s especially true of your potential workplace. “You’re going to spend a lot of time here with these people, so make sure you’ll feel comfortable before you choose to relocate,” she says. A visit is also the best way to learn about the community where you hope to live. 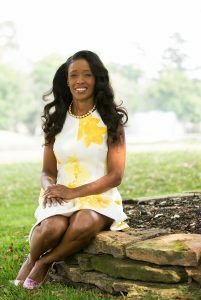 “Learn about the schools, about any work opportunities for your spouse if he or she will also be looking for a position, and seek out information about any cultural or recreational activities that you and your family enjoy,” says Hinds. And just because you have lived in the area before doesn’t mean you can skip this step, says Ron Davis, senior vice president of MD Preferred Services, a website that helps physicians find professionals like realtors, attorneys and accountants. “Even if you lived or grew up there, unless you’ve made recent trips back to the area, don’t assume the place you left will look the same.” As he points out, training can take a while, and if you’ve added a fellowship on top of that, chances are the place has changed. “You need to visit it again if you haven’t seen it in a while,” he says. 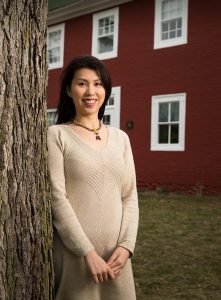 Ying Hui Low, M.D., an anesthesiologist who recently moved from North Carolina where she trained to Lebanon, New Hampshire, suggests bringing along the important people in your life to visit a new location. “You want people to visit you, so it lets them become comfortable with the area, too,” she says. Relocating involves a lot of moving parts happening simultaneously. Once you have the move scheduled on your calendar, you’ll need to establish a timeline so the transition will be smooth. This is also a good time to start your paperwork. Eleanor Hertzler, recruitment coordinator for Patient First, says that three months is generally a good rule of thumb for the credentialing process. Credentialing and licensing timing varies from state to state. “The process is very state-specific, so do some research for the state you’re moving to and plan accordingly,” she says. Your professional liability carrier will also need to know of your move, and, if you’re currently in practice, don’t forget to notify the Drug Enforcement Agency, any vendors you work with and of course, your patients. You’ll also need to find a place to live. Allow about a month for this step, Tsai says. Young offers one more “must” for your timeline if you have children. “I was lucky that my au pair moved with me, but if you’re relocating, establish your childcare option in advance,” she says. Finally, consult with movers, realtors and recruiters. These experts can help you fine-tune your timeline. Yes, you’ve visited the area, but now is the time to explore it. Each time Tsai moved, he took a month of vacation, he says. He used part of that time to travel. “When you’re working, you don’t have time for many vacations,” he says. But that month also allowed him to explore the area thoroughly, to look for a place to live, and to unpack. By staying in the area, you’ll not only become familiar with various neighborhoods but also gain a better idea of the real estate market and what kind of properties might be available in your budget. “You can [also] determine commute times,” says Low. Just because a house appears to be close to the hospital doesn’t mean you’ll be able to get there faster if traffic in that area is heavy at the times you’ll travel, Low explains. Hertzler says when she works with relocating physicians, she gives them a list that’s filled with helpful resources. “As recruiters, we don’t endorse any outside business, but we give our physicians referrals for things they may not think about, like mechanics, vets and dentists,” she says. If you’re checking out an area, you might want to put together your own list of frequently used services, then look to see what’s available in the areas where you’ll spend most of your time. Jeff Hinds, president of Premier Physician Agency, says the first thing you need to do before deciding to relocate is examine your career strategy. What do you want from a job? The goal is to find a position that’s right for you and your family—not grab any opportunity just because it happens to be in the location where you want to live. That’s exactly what happened to Jeffrey Tsai, M.D., an emergency physician. “It was early in my career, and I expected to do some shift work,” he says. But he found himself working all the late-night shifts. “The group wasn’t fair in assigning hours,” he says. Tsai soon moved from that practice to one that was a better fit, but if he had relocated from some distance away, the decision could have been a more difficult one. Asking yourself whether the move is right for you is a good start, but don’t forget to consider your family. Is it the right move for them too? The whole family should be on board. “If your children are school-age, you might want to delay the move until they are at a point in the school year where a move can be better handled, or even delay relocating until they are out of school,” says Tsai. The bottom line is this: When it comes to relocating, time is your friend. Don’t rush a decision. Decide what you want for your career and your work environment, listen to your family’s wants, check your contracts to make sure you won’t be penalized for a move, then make your relocation decision with knowledge and confidence. Finding somewhere to live, of course, may be the biggest challenge facing the relocating physician. One practical, economical option is to follow Young’s path. “I rented a furnished apartment for a year,” she says. That way, there was no need to move furniture twice when she decided to move somewhere else. Webber, however, says that, depending on the market, it can be much easier and less stressful to find a home ahead of time. “In tight markets, shopping and making offers from your hotel can create a lot of stress. If you can arrange a home shopping tour ahead of time, before the move, then the contract to close can be done during your absence,” she says. “If you rent first with the intention of buying a home in a year, the home may actually cost you more,” Webber continues. If, for example, you relocate to an area where there is a demand for housing, which is often the case in cities, chances are prices will rise over the year—while your options narrow. If you’re selling a home before you move, Webber also cautions you not to rely on “off-the-cuff” estimates of your selling price. “Don’t assume you’re going to make a good profit from the sale of your house,” she says. Sellers often underestimate their costs, in addition to any buyer’s expenses they may have to pay. “Get accurate numbers so you know what you will net when you sell,” she says. While you’re gathering information, it’s also a good idea to sit down and prepare a projection for all the expenses you’ll run into when relocating, says Hinds. In addition to moving costs and buying and selling a home, there will also be costs for trips to the area and for licensure. “Also consider costs of daycare and even the costs of living in the new location,” he says. Now that you’ve visited the area, established where you’ll live, seen to your paperwork and any childcare needs, it’s time for the move itself. Low said the move, for her, was easy. “I didn’t have any furniture or big items to move.” But for many, a move can be stressful. She suggests you talk to your employer’s human resources department and ask for referrals. Hinds agrees: “Most hospitals have realtor partners they work with and can recommend,” he says. Phairas adds that office and group practice managers can also refer you to realtors, movers and other experts in the area. “Most physicians are experts in their field, but novices when it comes to relocating,” Davis says. “And health care is way behind corporate America in successfully relocating people.” Hospitals can only do so much. “They may refer you to a realtor and tell you where to get three bids for movers, then you’re on your own,” he says. But relocating involves much more. “A consultant or relocating company can bundle services like mortgage contacts, financial advisors and attorneys,” he says. Will you be reimbursed for your relocation expenses? It depends on the employer and the location. Hertzler says employers generally help relocating physicians by putting together a benefit package that will ease moving costs. Whether that’s a signing bonus or a stipend depends on each situation. Tsai says his employer did not help him with moving expenses. “But our company does offer a loan to assist with the move or it sometimes offers a signing bonus,” he says. A typical amount of the loan or bonus is $10,000—which seems to be the going rate for relocation expenses when they are offered, adds Hinds. By now, you’ve found a home, unpacked your boxes, and are starting to know your way around the hospital and maybe around your new community as well. But don’t stop there. “This is the time to network,” says Phairas. Go to hospital meetings to meet your colleagues, and to medical and specialty society meetings to meet other physicians in the area, she says. These physicians can become friends or referrals, and they can also let you know about restaurants, parks, hiking trails and other things to do in the community in your area of interest, or maybe those of your spouse or children. 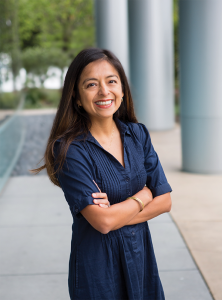 “Networking is important, and not just from a business perspective,” she says. Hertzler says Patient First often arranges a dinner where relocating physicians can meet with other physicians from the local Patient First urgent care centers. “It’s a time to meet colleagues and their families, and to learn more about the workplace and the area,” she says. It’s also important at this time to keep the happiness of your family in mind. You may be delighted with the new location and job, but if your spouse or children are having a miserable time of it, you may have to re-assess your priorities. Young says she gave herself a timeline. “I told myself and I told my family that we’ll give the location and the job two years. If after that time we weren’t happy, we’d move back. I think it’s really important to have an exit strategy like that, an escape route,” she says. You’re nearing the end of your medical training, and suddenly your email inbox is flooded with messages from physician recruiters alerting you to jobs that may interest you. Then the phone calls start, inquiring about your potential willingness to move from north to south, from east to west —and everywhere in between. Though at first it can be exciting to feel so popular, that euphoria can turn to anxiety as you anticipate making long-term decisions about your career and lifestyle. But being in demand is a plus, as long as you can convert a practice’s initial interest into a job offer you’d like. Your goal should be to express interest in certain opportunities without eliminating the possibility of others that may also turn out to be a good fit—while turning down those you’re not seriously considering. Fortunately, there are strategies you can use to zero in on the opportunities you’d most like while not damaging the possibility of future work. That’s the trick to handling multiple expressions of interest in a professional manner. “Perfect” may be attractive, but finding your “best fit” is a better goal in your job search. “The key is to remember that there is no perfect job and to keep in mind the factors that are most important to you and your family,” advises Chandler Park, M.D. Park says he has heard it said that, of the three overarching things doctors can choose from—money, lifestyle and location—only two are possible. That is, you can’t get your desired location and an exceptional salary and lots of free time for hobbies; you must pick your top two. For this reason, he put location—specifically, being closer to his hometown in Kentucky—at the top of his requirements, followed by the lifestyle choice to work in a hospital setting. Money was not a determining factor for him, though it was for several of his classmates. In fact, one colleague moved several states away in order to maximize his starting salary. Still, Bailey advises physicians to pursue positions that are good fits for their goals and lifestyles. For her, that meant good backup and flexible hours. With her full-time position squared away, she began looking for part-time work to fill in around her primary job. She found it two hours away at UTMB. Because Bailey had been upfront with the facilities where she interviewed for full-time work, she knew there would be no non-compete issues or scheduling problems if she decided later to take on additional part-time work. By being completely honest about her goals from the start, Bailey found the best fit for her. Abhishiek Sharma, M.D., an attending neurosurgeon at Honor Health System in Scottsdale, Arizona, advises figuring out what you want in a position while keeping an open mind about other types of opportunities that may also be a good match. The number of neurosurgeons, he explains, has not changed in the past few years despite increasing demand. The American Association of Neurological Surgeons confirms this trend, reporting in 2008 that, though the U.S. population had increased by 20 percent in the previous 15 years, the number of practicing neurosurgeons had remained static over the same period. The result of such a shortage, says Sharma, is that neurosurgery residents receive about three offers each. Some of those interviews and resulting offers may be in locations you hadn’t initially considered—and that’s OK. The differences you encounter among areas and organizations can enrich your options or confirm your initial vision. 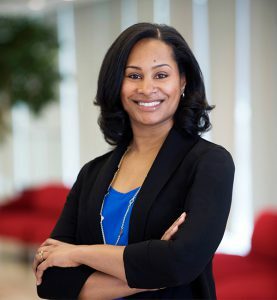 Regina Bailey, M.D., J.D., found a good work/life balance by being open about her desire for a role with good backup and flexible hours. There’s no question that physicians are in high demand. As a result, you may find yourself fielding inquiries from recruiters and hospital systems before you’ve done much evaluation of your career priorities and goals. Sharma reports having received an average of one or two emails per day listing positions available in neurosurgery. Bailey, too, received plenty of information on available jobs. The information you’re sent will vary from personalized, detailed inquiries to brochure-like information. 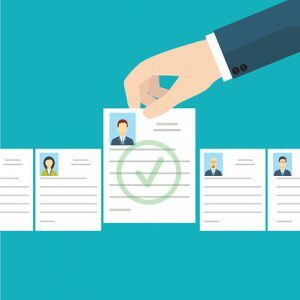 Much of the initial contact depends on the recruiter’s style, the organization’s approach, the confidentiality of the search, the urgency of the need, and other factors. After you’ve responded with interest, you may be invited to submit your CV if you haven’t already. A screening call is generally next, during which the recruiter continues to assess your fit and qualifications. If all goes well, more phone discussions or an invitation for a site visit may follow. If sitting back and waiting for news of an opening in the city you want seems too reactive, be direct and go on the offensive—it can work. One of Sharma’s friends decided to be proactive about his job search to increase the odds of landing a position in his hometown. Instead of sifting through incoming emails and taking phone calls as they came, the physician called the town’s main hospital and spoke with the in-house recruiter. He said, essentially, “I know you’re not advertising an open position at the moment, but would you be interested in discussing future openings?” Given the low supply of available candidates in the specialty, the hospital was only too happy to begin a conversation. That call resulted in subsequent phone calls and, later, an invitation for a site visit, followed by negotiations for a new role created just for him. Sharma looked at almost 10 places over the course of two years, narrowing that list to three based on geography: one in Wisconsin, where he was in residency; one in Chicago; and one in Arizona, which he ultimately took. All three jobs were appealing, so to break the tie, Sharma ranked each position based on three main factors: geography, the job itself, and intangibles about the opportunity. Then he weighted each factor, with geography counting for 30 percent of the decision, the job, 50 percent, and the intangibles, 20 percent. With that formula, it became clear that Arizona was going to be the best fit for him. Park interviewed at 12 places during the first round, focusing most on where he could become part of the community and be closer to family. He then whittled the list to three practices where he was confident he could be happy. After the interviews, he sent thank you notes to all the programs for taking the time to meet him; he was completely honest about whether he wanted to consider pursuing employment there. “Some recruiters were surprised by my forthrightness,” he says, but he didn’t feel comfortable keeping hospitals hanging after he had determined they were not the right choice. He advises physicians to be completely honest about where they are in their decision-making processes. Doing so enables you to uphold your professional reputation and avoid burning bridges you may need later in your career, especially since most physicians eventually move on from their first jobs. Where do other physicians live? What’s the cost of living like compared to where you currently live? What kinds of growth plans are in place for new physicians? How is the weather different from what you’re accustomed? What goals does the practice have for a physician in this role? What support network is in place to help physicians meet their objectives? What skills and qualities would the ideal candidate possess? That said, it’s also important to let a potential employer know when you just need more time. It’s OK to tell a recruiter you want time to check out more options. “No one goes on one interview and decides that’s it,” says Park. He says the typical number of subsequent interviews is two or three. “Telling other practices that you’re considering other options doesn’t make you less appealing,” he says. “It actually makes you more appealing.” It means you’re a desirable candidate. Simon Gordon, director of search operations and physician recruitment at Healthsearch Group, based in Westchester, New York, advises physicians to explore their options—but not to go overboard. “You can have too many [options],” he says. If you want to have initial discussions with several organizations, that’s fine, but once you have enough information to determine you’re not seriously interested in a position, don’t string that organization along. “Don’t pursue a role you know won’t ever be your final choice,” says Gordon. That only leads to wasted time (yours and theirs) and potential irritation. For this reason, limit your site visits to only those facilities that are serious contenders. Investigating job opportunities is not an all-or-nothing decision, says Park—it’s a process. After an initial on-site interview, you may be invited back for a second interview. This lets you know that the hospital or practice liked you. If you also liked what you heard and saw on the first visit, you can accept the second. “This allows you time to learn more about the program and tells the hospital that you’re interested. It lets them know how serious you are,” says Park. Similarly, declining a second interview conveys that you didn’t feel there was a fit and aren’t interested in continued conversations about the job. Don’t pretend to be interested once you’ve decided that you aren’t. After an on-site interview, a recruiter may ask for feedback about the job opportunity. 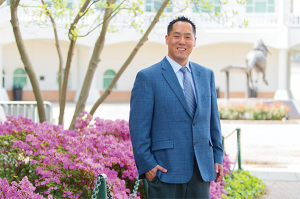 They may ask, “Is there anything you don’t like about our program?” Park strongly advises against getting specific about disadvantages you perceive early on, but instead wait for a second visit to bring up your concerns with their current physicians. If the negatives are significant enough to cause you to lose interest right away, however, consider reaching out to a physician to ask for their honest input about your concern. Gordon recommends being transparent and honest throughout the process. If you saw something on your visit that concerned you, bring it up. Ask questions to better understand the internal operations; strive to learn more about the day-to-day activities you’d be part of. And when asked for feedback, it’s important to express enthusiasm and to explain why it’s appealing and what value you can bring (if you think you’d like to work there). You can let the recruiter know that you’re considering other opportunities as well, but conveying enthusiasm about the job is essential if you want it, he says. Gordon recommends letting a practice know if you have reservations about any aspect of working for them before you make your final decision. “They’ll be frustrated” if you tell them after you’ve accepted another offer and your complaint was something they could have addressed, he says. Long-term, that reaction could limit future opportunities at the practice, should you ever change your mind. “Relationships are of utmost importance during schooling and the hiring process,” says Gordon. Developing and nurturing relationships with decision-makers, even if you don’t ultimately choose to work at their facility, can be beneficial for your career, especially if you determine you’d like to make a move a few years down the road. For that reason, it’s important to be considerate during your job search. “Don’t burn any bridges,” he underscores. After the second visit, many physicians are offered a contract. Park recommends responding right away if you receive a preliminary term sheet. After several months of conversations, on-site visits and discussions, both parties should have a good sense of whether there is a match, and making a decision should not take several more months, says Gordon. Although it can take weeks or months to get an offer, once you receive a contract, the hospital or practice will expect a decision within about a week. “They want an answer quickly,” says Gordon. As they’ve been carefully vetting you, you’ve been vetting them and must be interested in being employed there. Once you receive an offer, the decision to accept should be fairly easy—at least that’s the hospital’s assumption. Some physicians think that they can take their time deciding because the practice took so long to make their decision, but that’s not the case. “You have to be ready to move quickly at the end,” Gordon says. By the time they’ve extended an offer, they assume you’re as excited about working there as they are about hiring you. When you’ve narrowed your choices to the top two or three, it’s important to let the other practices know when you’ve received an offer. That gives them the opportunity to expedite their decision-making and potentially make an offer as well. Some hospitals, however, can’t move as quickly, Gordon points out, and you may have to decide between accepting an offer in-hand and waiting for an offer that may never come. “You need to understand that, until you get a contract or a signed offer letter, it’s still just an opportunity, which could get derailed,” he warns. It’s not concrete until you get that offer. Given the amount of time required to secure a medical license and credentialing in other states, Park recommends that physicians start their searches early—like the middle of their second-to-last year of residency. If you don’t start your search until the beginning or middle of your fourth year, you may not be able to start working until months after you finish residency. “The whole process is slow,” Park says, though some states are slower than others. In neurosurgery, whose residency lasts seven years, physicians start receiving information about jobs in their fifth year. Since it takes 12 to 18 months to recruit a neurosurgeon, says Sharma, it’s rarely too early to start reviewing and evaluating opportunities. Although much of the job hunt seems reactive—receiving emails and phone calls and following up with those that are of interest—physicians have a lot of control in the process. Rising demand for health care services means physicians are often in the driver’s seat when it comes to considering job opportunities. This is especially true in locations such as Mississippi, Idaho and Alaska, which have the fewest physicians per capita according to a recent report from financial advising website WalletHub. “Doctors have a fair amount of bargaining power,” confirms Sharma. As long as you stay in touch with the practices you’re interested in, communicate about where you are in your job hunt, and are honest about which positions may be a good fit, you’ll quickly become adept at juggling multiple job opportunities successfully. Physicians who know their natural conversation style are better able to tailor their interview skills. Were you the one who always took charge of group projects in school—or the quiet confidant whom people drew aside for advice? Do you deliberately limit your social interactions, or do you become more energized when you spend time around others? Whatever your preferences, recognizing your natural tendencies and personality traits—and knowing how to make them work for you—can go a long way toward job interview success. You’re probably already aware of your strengths and weaknesses, but when you’re facing a round of interviews, it never hurts to do a little introspection. A simple, informal method is to reflect upon what you already know about yourself. What have teachers always said about you? Friends and family? Which situations make you feel confident and comfortable, and which throw you out of your element? Reflect on your behavior patterns with a constructive, yet critical, eye. Once you’ve assessed your personal style—whether formally or informally—consider how to make the most of your strengths and adjust for your weaknesses. Active listening is a helpful interview skill. “People are willing to tell you what you need to know, if you give them the opportunity,” says William Silber, M.D. Perhaps you’re known for being a good listener among your friends, and your patients seem to relax and readily share with you. Even so, being a good listener in an interview can be difficult. In addition to having nerves working against you, your mind may be distracted—anticipating the next question or meeting or mulling over the last topic discussed. William Silber, M.D., a gastroenterologist from Dallas, makes a dedicated effort to focus on his listening skills at an interview, and he takes it a step further by asking targeted questions to draw out the information he needs. To fine-tune your listening skills, brush up in everyday life; listen more attentively to co-workers, your partner, even the radio. Another useful strategy is to practice mindfulness, which teaches you to remain focused in the moment. Even with the best intentions, don’t panic if your listening efforts are derailed, either due to a wandering mind or an unexpected tangent. Refocus on the speaker, perhaps paraphrasing or asking a question to zero in on the topic again. “So you’re saying that… ” is a good phrase to use to steer the conversation back to the original topic. Do you go after what you need? Malika Fair, M.D., M.P.H., identified a key question she wanted answered during the interview process. Prioritize your questions so those most important to you are answered first. Some people find it easy to ask questions; others proceed with caution, concerned they’re being a bother or coming across as too assertive. But asking questions—even the hard ones—is an expected part of any interview. Malika Fair, M.D., assistant clinical professor and emergency medicine physician at George Washington University and senior director of health equity partnerships and programs at the Association of American Medical Colleges, recalls that when she was interviewing, she raised a question that provided valuable insight into an area important to her. Fair says this input provided her with additional helpful criteria for ranking her options and determining where she’d feel most comfortable. Experts agree that you should always arrive armed with a solid bank of questions. In addition to showing that you’re well prepared, having questions on hand ensures you’re ready for whatever is thrown your way. Experts agree that you can’t have too many questions ready prior to an interview. Fair recommends having a handful of questions in mind and writing down several additional questions. “Once you run out of questions, ask if they mind if you pull out your list,” she says. What is the general call schedule? What provisions are made for backup or sick coverage? What is the structure for supervision? Do you have a formal mentoring program? Are there any parking/transportation concerns in this area? How does your spouse/significant other/family like this area? What do you like/dislike about the surrounding community? These questions are adapted from Veritas, the University of Texas School of Medicine student advising system, and used with permission. Access the originals at ow.ly/2UAc309WtoF. Do you tend to ramble? Being easy to talk to can be an asset in many walks of life, but in an interview, tread carefully—verbose responses can hinder success. “If you provide too many details [or] your stories are too involved, you can’t tell if they’re interested or if they’re bored. Don’t overload them,” suggests Silber. Whether you have the gift of gab or tend to ramble under pressure, practice providing short, direct answers to some common interview questions. Key in on your point early on. Studies show that the average listener remains focused for about 90 seconds. Being observant can also help you gauge if you’re talking too much. Watch for clues that someone isn’t really listening: robotic nodding, detached responses such as “hmm” or “uh huh,” or stolen glances at the clock. Have some strategies in mind to pull yourself back if you digress—like smiling, pausing and revisiting the question asked. “So in summary, my favorite rotation turned out to be….” Or simply wrap up your answer, leaving the ball in their court to request more details. Are you hard to get to know? Some people have no trouble opening up and sharing personal details, while others are naturally tight-lipped, especially in a professional setting. But if you keep your conversation only on academic and professional topics, you’re missing the chance to make yourself stand out as a unique candidate. If it’s hard for you to open up, plan ahead. Identify a few topics you’re comfortable bringing up that lend insight into you as a person. For example, location can be a starting point for conversation, says Screeney. Share what attracts you to the area at hand (or why you want to stay there)—whether you’re drawn by your passion for the ocean, making a move nearer to family or relocating to accommodate a loved one’s job. “Showing your ties to the area is always helpful,” agrees Screeney. Another talking point can be a pertinent fact or two about your family or significant others: children’s extracurricular interests, loved one’s jobs or educational pursuits, or special child or senior care arrangements. This information not only gives a glimpse into your world, but often prompts others to share details that could aid in your decision-making process. Even if you’re much more comfortable sticking with your credentials, you can still do your best to bring your personality to life in these conversations. Though you shouldn’t go overboard about your personal life, do offer a glimpse into your non-work personality. Whatever your interview style, there are some points you should always raise with your in-house recruiter. Family member’s careers. It’s essential to mention whether your spouse or significant other will need a new job—even if they’re not in the medical field. Your recruiter may be able to offer contacts and resources. Special requirements. If you’ll need the lowdown on schools, daycare, adult care or enrichment, ask to be pointed in the right direction. Your traveling companion. If your spouse or a significant other has joined you on your trip, mention it. They’re often welcome to attend a lunch or informal gathering. Their presence both helps people get to know you and gives you another perspective. Do you always do your homework? Research and preparation are second nature to some people, while others proudly tout their proven ability to wing it. Whichever has been your standard method of operation, experts agree that prep time is essential prior to an interview. 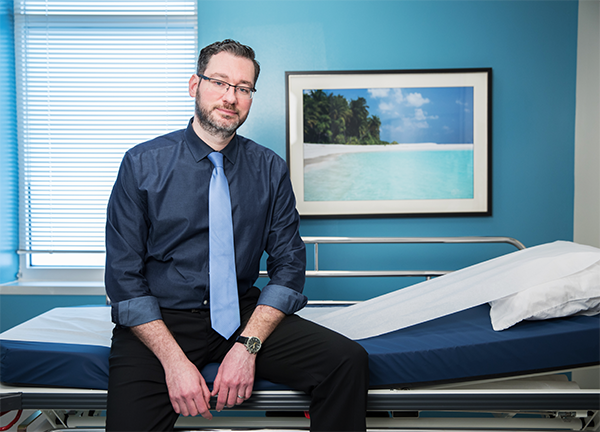 Christopher Ewing, M.D., emergency medicine physician at Dartmouth-Hitchcock Medical Center in Lebanon, New Hampshire, always goes into an interview armed with knowledge. In addition to learning the who’s who of people you’re meeting, delve into the company—read about their strategic partners, special interests, planned growth or future direction and values. Look for both things that attract you and things you question. Ewing recalls one interview where he used a potential concern to raise questions and generate a useful conversation. “I used this as an opportunity to ask questions to learn about their process and think of ways to improve it,” he recalls. Your research can also provide you with topics for side conversations. Make note of similar backgrounds, shared alma maters or mutual acquaintances, and pull these out when there’s a lag in conversation. Are you a perpetual pleaser? Do you often agree to things you don’t really want to do? Are you more likely to smile and nod politely than stir up controversy? Focusing too hard on trying to please can thwart progress in an interview. It doesn’t support a meaningful exchange of information and risks leaving your interviewers with a vague or false impression of you. Experts suggest initiating further conversation, rather than quickly accepting, when something doesn’t quite mesh with your goals. Ask the speaker to elaborate, suggest a compromise or present an alternative. Your probing could result in a scenario that works better for both of you. Do you avoid social interactions or seek them? Do you thrive in group settings, drawing energy from people? Or do you crave time alone to recharge and prefer to work independently? Whatever your style, your comfort in social interactions can be a factor in an interview. Watch your body language. “Sit straight up, lean forward toward your speaker, and appear engaged and interested. Keep eye contact,” suggests Fair. Schedule wisely. Book events at the time of day that works best for you and try to build in a window for down time to collect your thoughts and refresh prior to the meeting. Show that you’re not all about isolation. Bring up examples of past successful team activities. Don’t go overboard. Keep your answers focused. Don’t ramble, go on tangents or hijack the topic. Show stability. Discuss situations that depict your dedication and long-term commitments. Be humble. Touting your strong points may come easily and can be a positive trait. Just don’t take it too far—express gratitude for past opportunities and give credit to people who have helped you. Whatever your personality, most people find interviews stressful. Get an edge on your nerves through preparation. Understanding and working with your true nature can help you put your best foot forward. For job-seekers of all kinds, it can be hard to know. A simple PracticeLink.com search for opportunities in your specialty will give you an indication of the demand for physicians like you, but without knowing who else is vying for those jobs, it’s hard to get an accurate picture of supply. 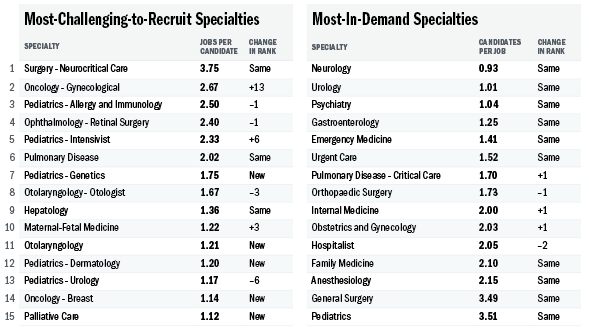 After reading these Indexes, ask yourself: Do these Indexes match your experience of searching for a job in your specialty? Do you need to widen or narrow your job-search parameters as a result? This PracticeLink Physician Recruitment Index was pulled April 1. Candidate ratios include physicians who have registered with PracticeLink.com within the past 24 months. Working in medicine can be taxing, no doubt about it. So it’s no surprise that when many physicians plan their next career moves, they look for locations with easy access to the great outdoors. Whether they opt for active hobbies like biking and skiing or meditative activities like hiking and fishing, the fresh air helps them find peace in nature. If you want to be close to nature while accelerating your health care career, read on to learn more about Glens Falls, New York; Columbus, Mississippi; Bangor, Maine; and Anchorage, Alaska. Glens Falls is located north of New York’s capital but south of the Adirondack Mountains. It offers the outdoor activities that come with living near a park, as well as excellent outdoor arts and culture. Nearby Saratoga Springs is bustling with outdoor concerts, performances and a world-class horse racing facility during the summers. In the winter, ski slopes, tubing tracks and snowmobiling paths distract residents from the cold. Chris Mason, D.O., found his job in an area where he had previously vacationed—Glens Falls, New York. Mason was living in Long Island at the time, and for several years, he had taken annual vacations to nearby Saratoga Springs with friends. He was very familiar with the area, so it wasn’t too hard of a sell. Backus invited Mason for an interview, and she showed his wife around the town. Today, Mason is a hematologist at Glens Falls Hospital. He enjoys living with his wife and infant son in New York’s Adirondack Region. “I love that there are things to do in all four seasons,” he raves. “We love to be outdoors. We love to ski. In fall and spring, the leaves change, which is beautiful. There is hiking and mountain biking. There are a lot of great restaurants, and there is a lot of culture.” Mason also enjoys seeing the New York Philharmonic during the orchestra’s annual residency at the Saratoga Performing Arts Center, an outdoor amphitheater in Saratoga Springs. The hospital’s work-life balance and the area’s high quality of life were what attracted Mason to Glens Falls Hospital. Combine Southern hospitality with a thriving economy, and you get Columbus, Mississippi. The area offers the best of both worlds in more ways than one. Newcomers can settle into historic homes or modern neighborhoods. Outdoor enthusiasts can enjoy boating and fishing or venture into the nearby woods to hunt. Physicians can relax in Mississippi nature one day and spend the next working at a 315-bed hospital that has been growing at a dizzying pace. John Reed, M.D., had almost retired. He was ready to pass his nephrology practice on to his partners and turn his focus to running a small farm, hunting and volunteering by tagging deer for a state wildlife study. But an opportunity arose at Baptist Memorial Hospital-Golden Triangle, a 315-bed hospital in Columbus, Mississippi, that was too interesting to pass up. 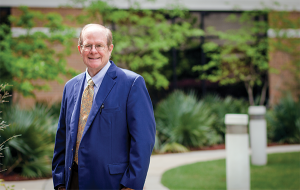 A born-and-raised Mississippian, Reed settled in Jackson, Mississippi, where he completed a nephrology fellowship and opened a dialysis and nephrology practice. He ran this practice for 30 years—opening four sites and recruiting several partners along the way. “We had clinical trials and published a good bit,” remembers Reed. After three decades, he wanted to spend more time at his cabin in the woods. 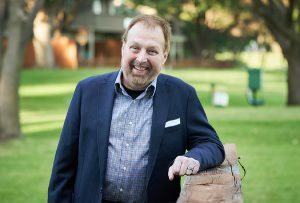 But just as he was getting ready to hand over his practice to his partners and spend more time outside, he learned Baptist Memorial was looking for a quality director who could start a hospitalist program. The position was right up Reed’s alley, and he could still enjoy the great outdoors during his off-time in Columbus. So Reed continued to work. Christina Dickey, who works in physician development for Baptist Memorial Hospital, says that Baptist Medical Group operates seven clinics in the Columbus area in addition to the Baptist Memorial Hospital flagship site. These include family medicine, internal medicine and pediatrics, cardiology, cardiovascular surgery, general surgery and pulmonary disease. As for Reed, he is able to work at a cutting-edge medical center and spend his weekends at his cabin in the woods. During the past hunting season, he provided deer meat to four needy families in the Columbus area. Reed’s commitment to caring for others extends to his life outside the hospital. He says that this sense of community is simply part of life in Columbus. Bangor, Maine, offers the visual beauty of New England, including the picturesque summers and the winters that look borrowed from a holiday card. Part of Bangor’s allure is its beautiful landscapes, as well as the many outdoor activities provided by nearby Hermon Mountain, skiing areas and the Penobscot River. Top talent is attracted to the area in part for the rural beauty and in part for the interesting challenges that come with a large service area. 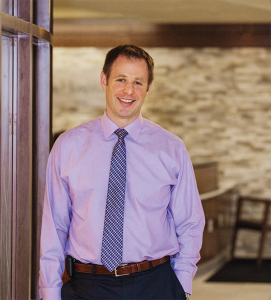 When Jonathan Wood, M.D., was looking for a new position, he had a choice between pursuing a job at a freestanding children’s hospital or looking for one at a smaller hospital with no intensivist program. Wood attended Yale for his undergraduate degree in history. He taught high school for three years before attending Dartmouth for medical school. He completed his pediatric residency at the University of Rochester in Rochester, New York, then worked at the University of Massachusetts Medical School. “When I was at University of Massachusetts Medical School in Worcester, we were looking to change our location, so I was looking at a bunch of different jobs,” Wood says. He didn’t have specific criteria in mind. Rather, he wanted to see what was available somewhat locally. Lisa Cramm is a physician recruitment and retention specialist for Covenant Health, of which St. Joseph Hospital is a member. “We are a fairly rural community, but we are lucky enough to provide good health care and have top-notch equipment. We are four hours north of Boston. Most patients don’t want to get their health care outside of the local area. If possible, they want us to manage it and not send it out to referral centers. Hospitals our size don’t often have the opportunity to do this, but we do. We can see and manage pretty complex cases,” says Koffman. Eastern Maine Medical Center also channels a community-oriented mission. If you picture coats, hats, boots and scarves when you picture Alaska, you’re only half right. Alaska winters offer lots of reasons to get bundled up and enjoy the great outdoors, but Alaska also has picturesque summers. Many residents enjoy hiking, biking and camping—no parkas necessary. To say that Daniel Hartman, M.D., is outdoorsy would be an understatement. He is a family practice physician with Southcentral Foundation, an Alaska Native-owned health care organization in and beyond Anchorage. And long before he became a physician, Hartman spent his time outside, learning about the many inhabitants of the great outdoors. As an undergraduate at the University of New Hampshire, he majored in biology and concentrated on marine invertebrate zoology. His early career foreshadowed his move; he spent some time as a marine mammal biologist, a career that brought him to Alaska frequently. Southcentral Foundation provides a full scope of health care services to those living in Anchorage and the 55 rural villages in the Anchorage Service Unit, a service area in southcentral Alaska that spans 107,400 square miles. Southcentral Foundation offers a wide spectrum of care, including audiology, pediatrics, optometry, OB/GYN and Native men’s health services. The foundation also jointly operates an emergency room at the Alaska Native Medical Center with the operators of the medical center, the Alaska Native Tribal Health Consortium. Another Anchorage employer is Alaska Regional Hospital, a 250-bed hospital which is part of HCA Healthcare. The hospital’s offerings include an orthopedic and spine center, a wound care center, a cancer care center and a NICU. Costanzo believes Alaska’s outdoor offerings are a big part of the draw. “Anchorage is a wonderful, large-small town. It’s a cliché, but if you do really enjoy four-season recreation, you’ll love it here,” says Costanzo. When the snow melts, Alaskans leave the extra layers of clothing at home and enjoy other warm weather activities. “In the summer, my family and I do a lot of camping in the national parks,” says Hartman. Saupe agrees that there are plenty of outdoor activities. In this edition of Tech Notes, we’ll cover three useful medical apps for daily practice: two for physicians, and one to share with your patients. OrthoFlow is almost like having an orthopedic surgeon in your pocket. It’s especially helpful in primary care, urgent care and emergency room settings, where a lot of basic fracture management occurs. OrthoFlow’s introductory screen shows a full human skeleton. Simply tap until you localize the affected bone. Once you’re done with this quick process, the app asks questions about displacement, neurovascular function and more. Then it provides specific recommendations, such as which type of splint to use and what key details to discuss with your orthopedic surgeon. Key ways to use this app. If you are a primary care, urgent care or emergency medicine provider and your patient’s X-rays show a fracture, this app will help you determine fracture management. 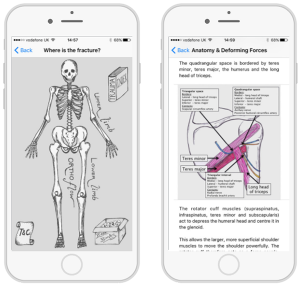 If you are an orthopedic surgeon, the app’s appendix will provide you with detailed information on necessary surgeries and items to discuss in morning fracture rounds. Step-by-Step Febrile Infant is yet another helpful app from Dr. Joshua Steinberg. 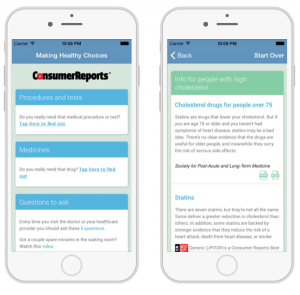 Steinberg has created more than 15 medical apps, and this one is a great example of turning validated research into an easy-to-use app. The app is based on the Step-by-Step Approach, a clinical evaluation protocol that helps physicians decide on care for febrile infants. A validation of the Step-by-Step Approach was published in Pediatrics in July 2016. The app not only recreates the study’s findings and suggestions but also offers several sections that explain the study further. A word of caution: Since the Step-by-Step Approach is a deviation from traditional practice and management of a febrile infant, make sure you understand your local practice and standard of care before using the app. Key ways to use this app. 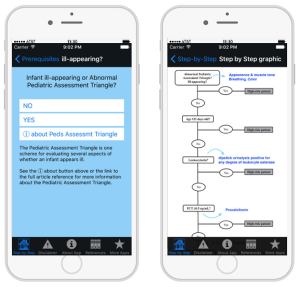 If you are an emergency physician or pediatrician who cares for febrile infants, this app can help you understand the validated Step-by-Step Approach. If the Step-by-Step Approach has become the standard of care in your area, this app can help suggest management of care. When patients come in with very specific expectations for care, it can be difficult to convince them that a particular test or a round of antibiotics is unnecessary. That’s where the Making Healthy Choices app comes in. In the app, patients can drill down to specific procedures, tests and medicines to learn more about the indications for each of these. This helps them understand why you are—or are not—recommending a certain course of action. One of my favorite features is the “Questions to Ask” section, which gives patients important questions to ask when a physician recommends a procedure. Key ways to use this app. If a patient or a family member doesn’t understand your recommendations, encourage him or her to download the app and read about a particular procedure, test or medicine. Iltifat Husain, M.D., is the editor in chief and founder of iMedicalApps.com, the leading physician publication on digital medicine. He is also an assistant professor of emergency medicine at Wake Forest University School of Medicine.